Silver medallist at last year's tournament Fan Zhendong, has defeated Xu Xin to win the Liebherr 2016 Men's World Cup on the final day of the event in Saarbrücken. 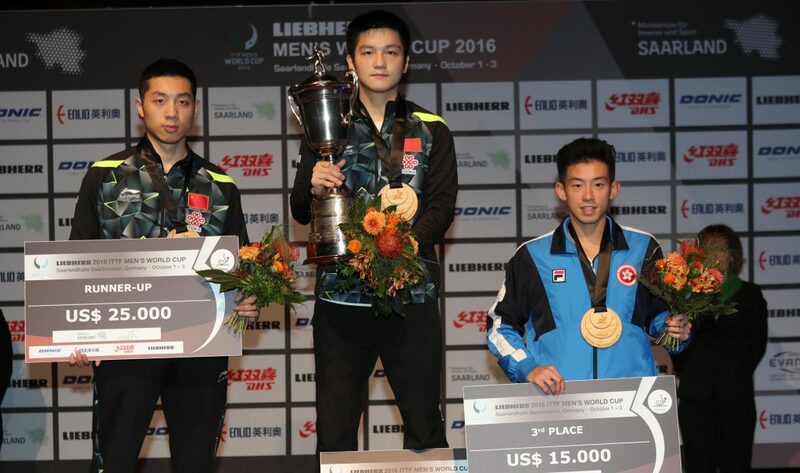 Fan Zhendong (CHN) saw a great opportunity pass at the 2015 World Cup when he lost out in straight games to fellow compatriot Ma Long in the final, but one year later the 19-year-old has taken his place on the top step of the podium. Heading into the 2016 World Cup final Xu Xin (CHN) went into the match with optimism, having won his previous encounter against Fan Zhendong at the 2016 Korea Open in June. The other meetings in 2016 between the two players had resulted in victories for Fan Zhendong (2016 Qatar Open and 2016 Laox Japan Open) setting up a fascinating duel for glory at the Saarlandhalle. Right from the beginning of the World Cup final the spectators were treated to some mesmerising rallies as Fan and Xu established a high standard of aggressive Table Tennis early on in the match, and the runner up from 2015’s rendition of the competition Fan took a 2-0 lead after the number one seed made a positive start to proceedings. Then Fan made it three consecutive game wins with another strong display in game three, but Xu wasn’t done with the match and success in the fourth end shifted the momentum in his direction. Xu Xin was on the up and he began to claw his way back into the tie forcing Fan Zhendong into a tight spot in game five. With the scores level at 10-10 Xu had an opportunity to put some doubt into opponent’s mind, but Fan held his nerve taking the next two points to complete the triumph (11-5, 11-6, 11-8, 7-11, 12-10) and win the Liebherr 2016 Men’s World Cup. “This is a big win for me, it’s my first senior world title trophy, it feels fantastic to win such a big event, I don’t know what to say” – Fan Zhendong (China).